Say on Pay is still voluntary in Canada and the uptake continues with 156 companies having Say on Pay votes in 2014, up from 133 last year. Say on Pay is still voluntary in Canada and the uptake continues with 156 companies having Say on Pay votes in 2014, up from 133 last year. 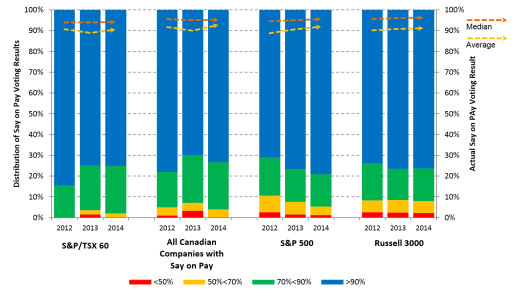 Among the S&P/TSX 60 index companies, 82% have adopted Say on Pay. However, in total less than 4% of Canada’s public companies have adopted the practice. 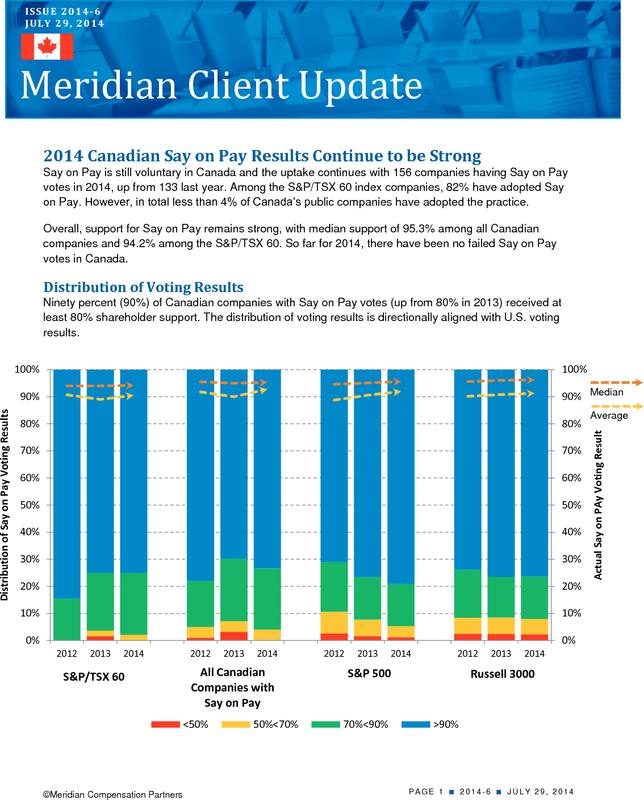 Overall, support for Say on Pay remains strong, with median support of 95.3% among all Canadian companies and 94.2% among the S&P/TSX 60. So far for 2014, there have been no failed Say on Pay votes in Canada. Ninety percent (90%) of Canadian companies with Say on Pay votes (up from 80% in 2013) received at least 80% shareholder support. The distribution of voting results is directionally aligned with U.S. voting results. For those companies that either failed or received less than 70% support for their 2013 Say on Pay proposal, 3 have successfully turned around last year’s vote outcome, receiving more than 80% shareholder approval for their 2014 Say on Pay proposal; 2 others passed but with “yellow card” status (see following table). Issuers are clearly taking Say on Pay voting results seriously and addressing concerns through a combination of improvements to incentive design and governance practices, often suggested during enhanced shareholder engagement efforts. 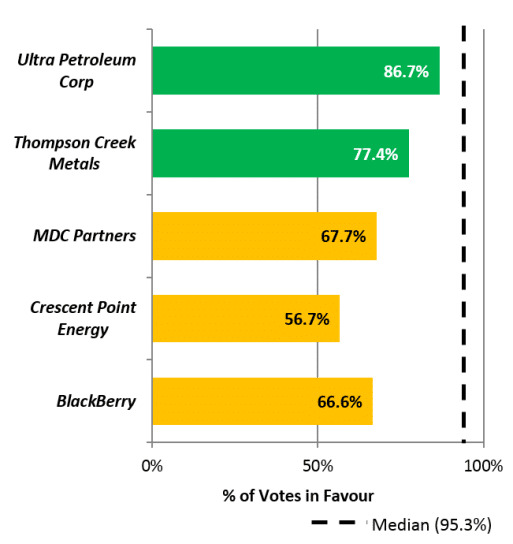 Given the small sample it is difficult to interpret the results, however, the ISS against vote recommendation seems to correlate with significantly reduced shareholder support, although not necessarily with a negative vote outcome. In the US, a negative ISS vote recommendation this year at the S&P 500 has correlated with shareholder support lower by about 26 percentage points; but impact may be decreasing as this is down from the three-year average of 33 percentage decreased results, as the largest institutional investors are increasingly building their own, sophisticated review models, instead of outsourcing this process to ISS. The debate regarding the regulation of proxy advisors such as ISS continues with regulators introducing proposed guidance in both Canada and the US. 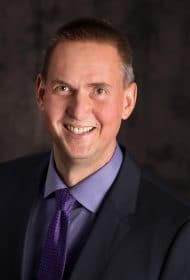 While these proposals have not gone far enough to satisfy most, proxy advisors and their institutional investor clients believe that the guidance (which generally reflects their current policies) provides reasonable ‘checks and balances’ in the system.